This Sunday is 56 days on this trip of ours. And out of all of those 56 days I have never been more excited, happy, and proud of my traveling partner in crime and the guy I married almost 1 year ago, my PADI certified scuba diver husband, Gregory Gerber! He accomplished something that scares the living bejesus out of me, and he rocked it! I wish I was as fearless as he is when it comes to the sea (and bugs). 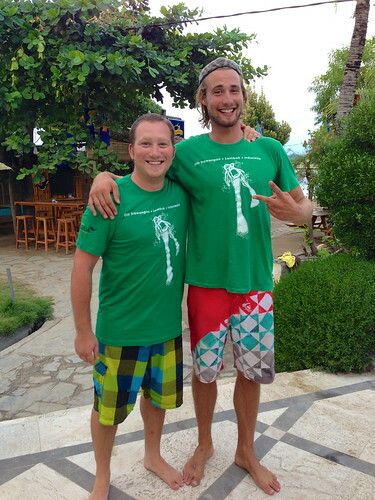 Greg got certified at Big Bubble on the small Island of Gili Trawangan off of Lombok, Indonesia. The whole crew at Big Bubble were amazing, smart, fun and most importantly kept GG safe since I wasn’t there to protect him from all the sharks, turtles, and Nemo’s they swam with. This picture was taken right after his dive instructor, Anders, officially certified him and he got a t-shirt to prove it (and a temporary cert card that doesn’t look quite as cool as the t-shirt)! Now we are both excited for our next scuba location. Greg for the actual scuba-ing, and me for the lovely beaches that are usually close by! Any good diving locations you have on your travel wish list that we should add to ours? HA! You realize how unnatural it is to be down there when you look around at the fish and their not any making bubbles. So proud of u Greg. We now have another diver in the family and someone to sit in the sun w/ me while u guys are exploring the ocean blue. Yeh for Greg I will have to re certify to dive with you! Woot! Congrats to Greg – that’s an awesome accomplishment! !